I saw the iReport on CNN today about Erik Bendl, AKA ‘World Guy’, who has taken one of his favorite pastimes, pushing his giant inflated Earth Ball around the neighborhood for exercise and fun, and is using it raise awareness and money for charity. 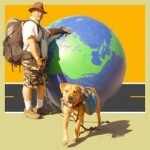 Currently, he has undertaken a cross-country trek, pushing his Earth Ball, for diabetes awareness. You can follow Erik’s progress at his WorldGuy website or on the WorldGuy Walk for Diabetes Facebook Causes page.